We present a method for measuring a communication signal’s inband error caused by a non-ideal device under test (DUT). In contrast to the established error vector magnitude (EVM), we do not demodulate the data symbols. Rather, we subtract linearly correlated (SLIC) parts from the DUT output and analyze the power spectral density of the remaining error signal. Consequently, we do not require in-depth knowledge of the modulation standard. This makes our method well suited for measurements with cutting-edge communication signals, without the need to purchase or implement a dedicated EVM analyzer. 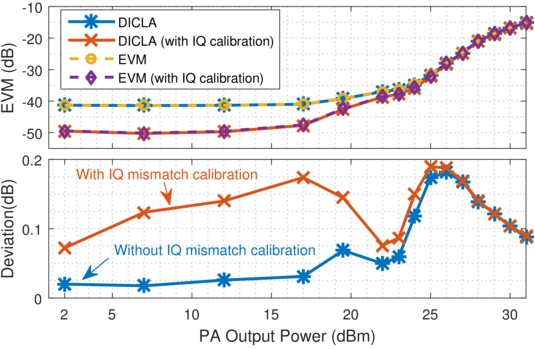 We show that our SLIC-EVM approach allows for estimating the subcarrier-dependent EVM for typical transceiver impairments like IQ mismatch, phase noise, and power amplifier (PA) nonlinearity. We present measurement results of a WLAN PA, showing less than 0.2 dB absolute deviation from the regular EVM with demodulation. The figure presents measurement results of the RFMD RFPA5522 power amplifier using a 40-MHz bandwidth WLAN input signal with swept power. High input levels drive the PA into saturation, which leads to an increased error vector magnitude (EVM). At lower levels the IQ mismatch of the signal generator is the predominant source of error. However, the error due to IQ mismatch can be reduced using widely-linear IQ mismatch calibration. Our EVM estimate deviates less than 0.2 dB from the standard EVM over the entire range of distortion levels, both with and without IQ mismatch (calibration).